Aengus Lyons is a Sligo man. He went to secondary school in Ballymote and then completed a degree in Web Development at IT Sligo. After this he was lucky enough to get a job in Lionbridge in Ballina, Co.Mayo where he has worked and lived since 2006. On the 16th February 2014 Aengus went to play a game of indoor football. It was an average Sunday afternoon. Minutes into the first half, Aengus’s life changed forever. He fell and hit his head against the wall and snapped his spinal cord. He was resuscitated at the scene by his friends before being rushed to Sligo university hospital. He was then sent by ambulance straight to the Mater hospital in Dublin. It was there that Aengus got the devastating news that would change his life forever. He was told he sustained a high neck spinal cord injury at C1 C2 level and was paralysed from the neck down with no hope at all for any recovery of his movement. Aengus left the Mater Hospital in March 2016 and went to the National Rehabilitation Hospital. He spent four months in the NRH and then finally got to make his return to Sligo. Unfortunately this was to another hospital. He spent two years in Sligo University Hospital. He was discharged into the community in July this year (2018) and is now in temporary accommodation in Woodheaven in Sligo. He would love to return home and this is why we are fundraising as Aengus will need a purpose built extension added to the family home. 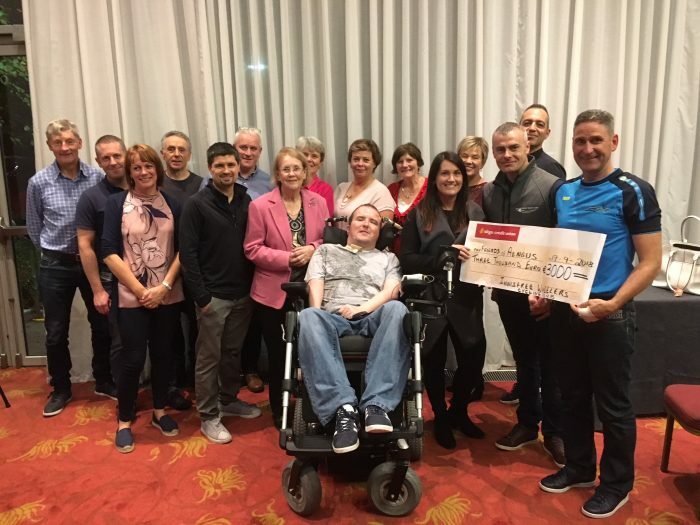 This week Aengus met some of our members as they gathered for a club meeting, and the proceeds of the Three Counties sportive was presented to the charity with Aengus present. 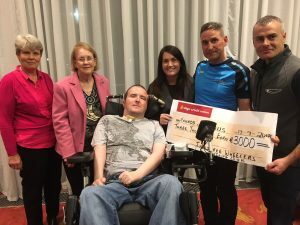 It was great to have Aengus present on Monday night when the club presented the cheque to “Friends of Aengus”. We had a great response from members who cycled and also from the sponsor Kevin Egan Cars, who were represented by Mark Walsh at the presentation.